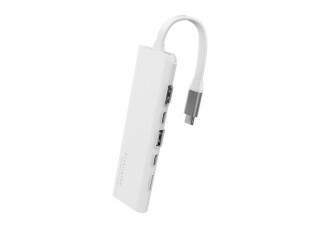 This hub solves the problem of having insufficient ports on a computer with USB-C ports. The USB-C HUB has five different ports: HDMI, USB-C, USB-A, USB-C (DC in) and a Micro-SD/TF card slot. The HDMI port supports high definition and 4K/1080p video transmission, sound and picture synchronization as well as support for 3D video. 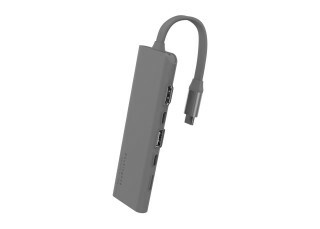 The product has two USB-C ports. One of the USB-C ports (marked with "DC in") only supports (fast) charging and can be directly connected to a charger to charge the computer. The other USB-C port supports data transmission as well as charging external devices. The micro-SD/TF reader supports reading or writing of micro-SD/TF cards.